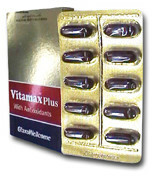 Dietary supplement of vitamins and minerals. Unless otherwise prescribed, the usual dose is one capsule daily or every other day after breakfast. – Hvpertension resu tAg from ginseng abuse syndrome is associated with prolonged high doses-ef-qlnsenq with concomitant use of caffeine. – Mastalgia with diffuse breast nodularity has been reported. – Should be avoided in pregnancy and lactation. – Contraindicated with anticoagulant and diabetic therapy. – Contraindicated with phenelzine (MAO Is) as it may cause headache tremors and mania. – Contraindicated with loop diuretics. – The feaces of patients taking iron salts may be colored black. – Shouldn’t be taken by patients with sensitivity of pollen grains. Box containing two Al/PVC strips (10 capsules/ strip) and inner leaflet. Store below 25°C in dry place. GlaxoSmithKline S.A.E – El Salam City- Cairo-Egypt.